As American companies undertake international business activity a common question that arises is the risk of foreign currency transactions. There is some - but it's there whether or not the sale is made in USD or not. This plays out over years. There are well documented cycles of currency strength and weakness, and while current geopolitical turmoil seems to be creating anomalies, we can call it basically a ten year cycle. Much like turning tides, the movements on either end tend to be smaller and the movements in the middle somewhat faster. This isn't absolute, but for sake of argument it's approximate. If you enter an export market when the USD is quite low (meaning it takes less of the local currency for your buyers to acquire your product since one unit of their currency buys more US dollars) then you'll have a natural pricing advantage which may facilitate your market entry. If the dollar strengthens over time, then even if you never change your sell price in USD, the cost for local buyers will be higher (since now one unit of their local currency buys fewer US dollars.) That could lead to increased local competitive pressure - and possibly losing some buyers and having a harder time adding new ones. In other words this is a strategic risk. It's no different than major long-term cycles in costs of petroleum or key materials used in your products. That could easily be 2-6 months in many B2B scenarios - and during that time a change in valuation of 10% would be unusual but prudent to plan for. After all, for most B2B companies with a 50% gross margin and 20-30% net, losing 35-50% of profits would be painful. This is a well recognized risk, and it's the reason many American companies insist on payment in USD. They believe (mistakenly as you'll see below) that it protects them from this exposure. This is a tactical risk. The USD is the world's reserve currency, so there's no reason not to use it, right? Certainly it's well recognized and coveted in many places. However, it's not always easy or inexpensive for your foreign buyers to acquire the US dollars they need to pay you. In fact, sometimes it's barely feasible, and it's always an extra step. Therefore by insisting on only receiving USD and refusing to sell to buyers in their local currency, you become a slightly less attractive vendor. The cachet of "Made in USA" and the quality and innovation which your products likely represent are powerful selling justifications. But in my experience if you're refusing to sell in local currency, you're probably missing 50-70% of your potential sales. This is particularly true for channel sales. Building a mutually beneficial channel relationship requires business collaboration beyond accurate and timely transactions. You're often asking a channel partner to invest in growing the market for you, and probably even buying inventory to hold. Demanding USD on top of that is often perceived as arrogant. If you sell products through ecommerce, your platform should facilitate the process of converting buyer payment in local currency to remittance in your preferred currency. However, the exchange rate and transaction cost bear close scrutiny - you might find 5-10% embedded cost! Many American companies try to protect themselves against non payment by using letters of credit or demanding payment in advance. The former is complex, expensive and fraught with exposure. (Foreign receivables credit insurance is a great, inexpensive alternative.) The latter (requiring payment in advance) costs business opportunity just like demanding payment in USD. By demanding payment in USD companies try to shift the currency risk to their buyer - and they do. HOWEVER, they don't eliminate the risk. Instead they leave it to someone else (the buyer) to manage. If it's not managed, it often redounds to the seller. Here's how. Let's assume you sell a large transaction to a foreign buyer which will involve some time passing between agreement and first payment, and then final payment. This could be for a large order of products which are partially paid on order and partially upon shipment or delivery. It could also be for a service (e.g. software) which is partially paid with the agreement and then incrementally against milestones. If it's an increased cost of 5% they'll likely pay your invoice in USD but weigh that cost very carefully when it's time to reorder. They may negotiate more aggressively, purchase domestically or find other alternatives. If their currency falls faster/further, the same final invoice in USD could cost them 20, 30 or maybe 50% more in their local currency. They may, at that point, be unable or simply unwilling to pay that cost. You could well find they short pay the USD invoice you hold as a receivable, or default altogether. This may not be conniving on their part - it could be they simply can't pay it because it would create insolvency, or in some cases because they can't obtain the USD required to pay due to currency restrictions. It's important to note that Foreign Receivables Credit Insurance policies might cover all these scenarios (have a clear conversation with your broker to understand what is/is not covered!) But if a claim is paid you likely won't get that buyer covered again and you might lose an otherwise great customer that is caught in some tough circumstances. If you sold in their currency, however, you needn't guess about whether that risk is covered. You own the risk and you can manage it. It's simple and inexpensive to do so through FX hedging. Hedging sounds tricky. Futures, options, spot transactions all carry associations with fortunes lost in trading pits, Enron shenanigans and the implosion of derivatives in 2008. If you buy something today before the sale ends knowing you don't need it for a week, month, season or year....you're hedging. If you sign a five year real estate lease with fixed pricing or pre-agreed annual increases...you're hedging. If you pay a copier service a fixed monthly cost for machine, consumables and service....you're hedging. FX hedging is no more complicated. At any point in time you can determine how much of any currency you'll need to receive - at any future point in time - to yield a specific amount of USD. And then you can agree today to do that transaction in the future. The next step is to lock that in so that you preserve your margin on the payments in the future. Now you have guaranteed that when you receive the agreed to foreign currency, you will receive in exchange the number of US dollars that you expect and need to maintain your margin. "But my banker doesn't seem to know much about it..."
I often compare this to setting up and running payroll. The first time is like a root canal - so many forms, regulations, authorizations, etc. You hold your breath...and it works. The second time it's less dramatic, but you're still learning how to submit the hours, note who's participating in the 401K and who's making health insurance co payments. The third time is pretty routine and after that you're barely even thinking about it. That's true of foreign currency transactions as well. 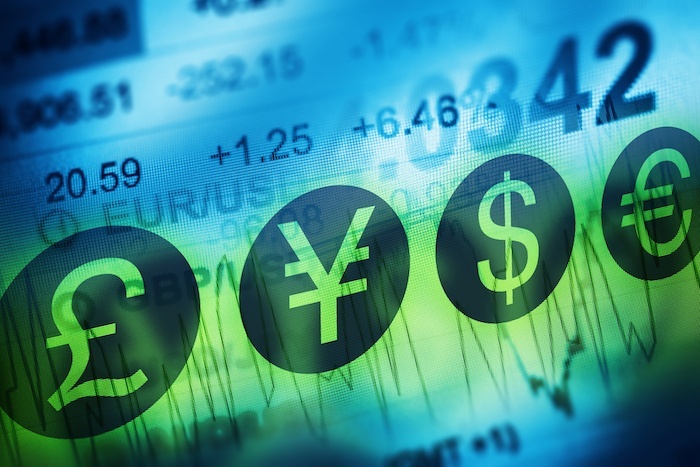 Want to take a deeper dive into currency risk? Download our free guide.